This movie is definitely not as happy as the title infers. 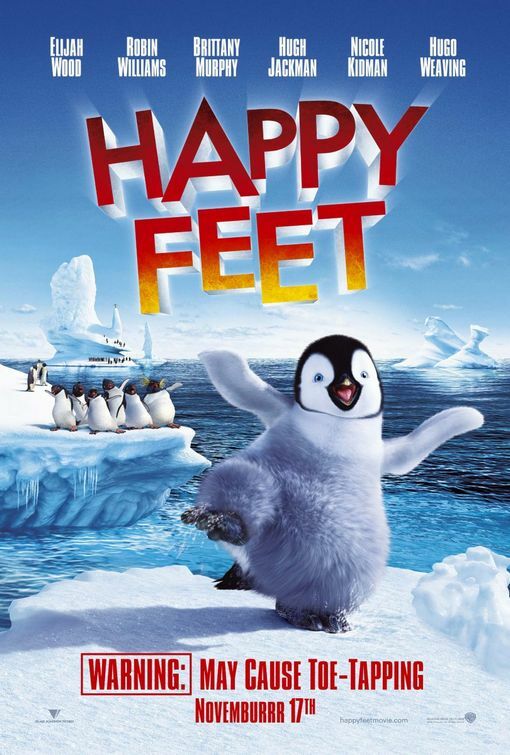 With a title like Happy Feet, you’re expecting a fun, family-entertaining, cutesie movie that your two-year-old is probably going to want to watch every day for the next six months to a year. This movie is actually kind of hard to watch. I’ve only seen this movie twice: when we got the DVD for Easter 2007, and then again for this blog, so eight years later. I did not like it my first time through, because the only thing I took away from it was the environmental message. And I still don’t like it for additional reasons. Half of this was a misfit story, and the other half was a humanity-needs-to-give-a-crap story. Two halves which I didn’t really feel meshed very well with each other. They could have written it so that if flowed a bit better. It almost felt like I was watching segments that had just been strewn together. And if the misfit half of the story wasn’t a metaphor for blindly following stingy religion, I don’t know what is. Noah the Elder even calls Mumble’s dancing a “Pagan display;” he wants the young penguin to repent or else be banished. Religion doesn’t have to change with the times to stay relevant, but over time it does have to change the way it approaches certain things; the overall message need not change. There are some parts that are a little too adult for my taste. For instance: the find-a-mate scenes. First of all, they basically recycled Norma Jean’s scene for Gloria’s. (It just hit me that Nicole Kidman’s character was a portrayal of Marilyn Monroe…named Norma Jean… I was wondering why her voice was so high and whispery.) Secondly, all the men gather around these two girls and are practically cat-calling them. Yes, it’s mating season, and no, not every guy makes a girl swoon, but half of the guys just talked about mating. I’m sure this was another jab at humanity, but really? Wasn’t this part of the movie supposed to be about each penguin’s Heartsong? I get it: humanity is a plague upon the earth. We disrupt food chains and habitats, and have a tendency not to give a crap. We’re not all like that, but there are too many of us who are. All of this is blatantly obvious in the scene at the aquarium where none of the humans are paying any attention to the tank of penguins; one boy is playing on a hand-held gaming device, children are running around, and people are chatting with each other wrapped up in their own world. The film showed whales with deep propeller scars. The elephant seals said–and I quote– “They’ll cut you up, melt you down, and turn you into fun-food.” I am literally squirming inside! How heavy-handed do you have to be??? And then there’s Lovelace, gasping for breath from the plastic six-pack rings the entire time they’re traveling to the site where he’d found the rings, yet they’re just going to hang around while a sub-plot happens and he’s wheezing in the background. Before I had complained that Wall-e was the same as Happy Feet; it is not! At least Wall-e had a decent story to follow; one that I will willingly watch again. This entry was posted in family, PG and tagged 2000s, Brittany Murphy, Elijah Wood, Hugh Jackman, Hugo Weaving, misfit, Nicole Kidman, Robin Williams. Bookmark the permalink.